With authentic salsas, perfectly spiced meats, and even aquas frescas, Mexican-inspired dishes can be made healthier and stay just as tasty. This Chicken and Black Bean Burrito Bowl is the perfect example: The fresh flavors and wholesome ingredients make an ideal (and easy!) lunch or an excellent dish to meal prep. 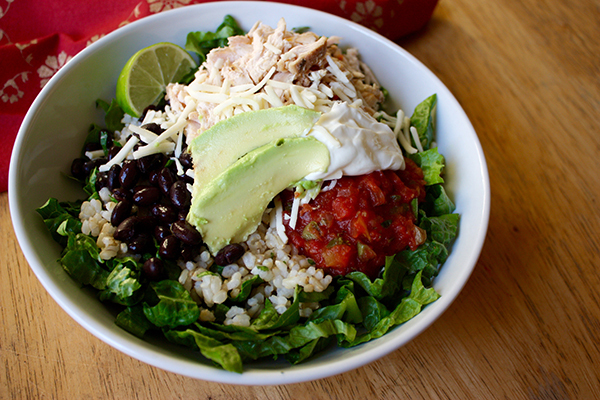 Make your own healthy Mexican-inspired chicken burrito bowl with cilantro-lime rice and all the trimmings. This recipe uses black beans, but you can substitute pinto beans if you prefer. With fresh salsa, a squeeze of lime, and creamy Greek yogurt on top of crisp romaine lettuce, you don’t need any kind of dressing! With black beans, fresh salsa, a squeeze of lime, and creamy Greek yogurt on top of crisp romaine lettuce this Chicken Burrito Bowl is an excellent lunch. A great lunch option. Replace brown rice and beans with veggies for dinner.